Maybe I should say “recap” instead of report. 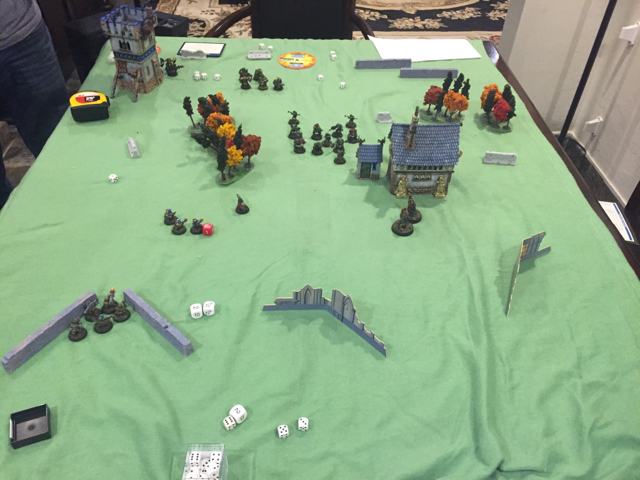 We played another 1000 point game of 40k 2nd Ed. 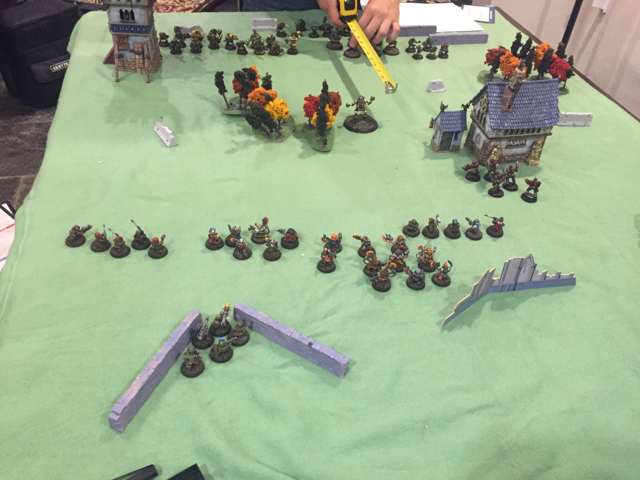 This time using my squats (with my friend’s space marine scouts as allies) versus my orks. The squats were lead by a modestly equipped warlord - powerfist, plasma pistol, and otherwise just the basic gear. There were a couple of warrior squads with a plasma gun each, a ten man unit of cyberslayers (we used a fanmade 2nd ed squat codex meant to update the black codex), a thunderer squad with one lascannon and one heavy plasma cannon, and allied space marine scouts with a heavy bolter. We were a few points low on the squat side, which is fine for our mentality. The orks were lead by warboss Steefan Horking - armed with a powerfist, spiked arm, gyrostabilized monowheel, and refractor field. 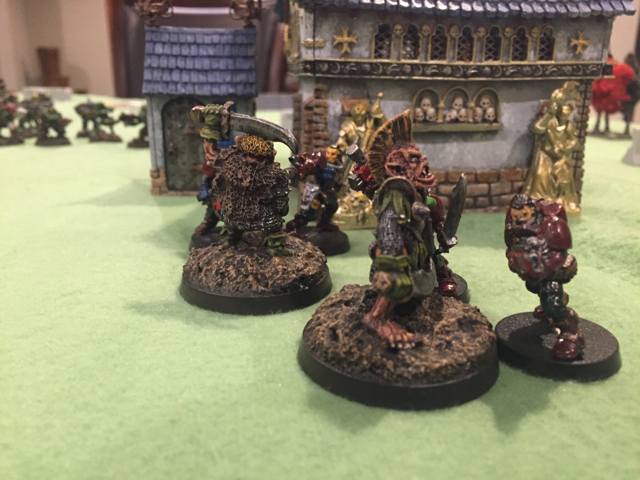 Orks has a second character in the form of an ogryn mighty hero with cybork body, who led a unit of ogryns (my newly painted iron claw black orcs). The army was rounded out with a ten ork squad of Bad Moonz (two missile launchers), and two five ork Blood Axe Squads (each with a missile launcher). We rolled to see who would take which army, and I wound up with squats. Here was the board as orks began the game and the cyborked ogryn started forward. In their first turn, the orks advanced the ogryns and warboss (shrewdly keeping the latter out of sight). Frag missile fire trimmed down several squat squads, including eliminating two plasma gunners. The squats answered with a turn likewise focused on heavy weapons fire. 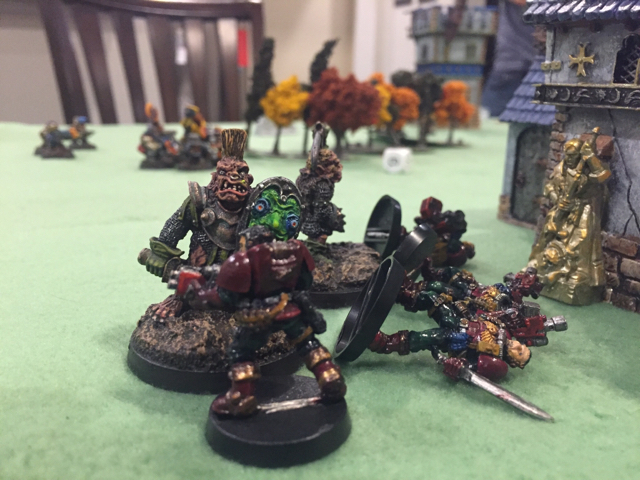 Here was the heavy plasma’s shining moment of the game - firing on full power, it knocked six wounds off the cyborked ogryn mighty hero and vaporized another ogryn. (It fires one more time this game, after recharging, and wildly deviated hitting nothing). Once the cyborked hero was in hand to hand, there was little way for the squats to successful damage him. With that in mind, the lascannon gunner easily blew the last wound off him. The scouts fired their heavy bolter using hellfire shells, eliminating an ogryn and hanging two wounds on another. On the orks’ turn, close combat began. 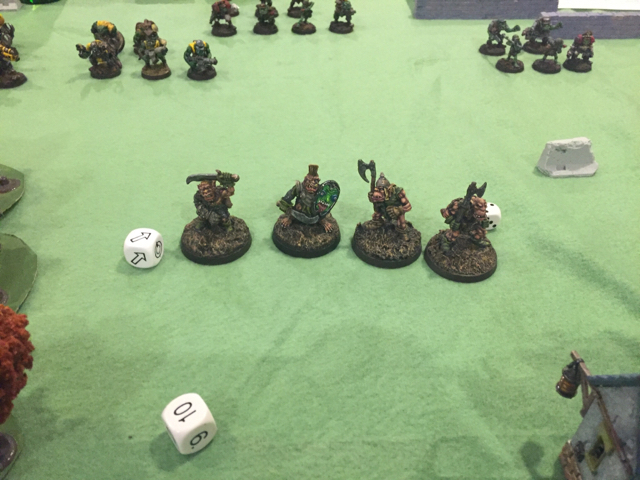 Warboss Steefan Horking tried to charge, but fell short! This left him stranded by the hearthguard and squat warlord and the cyberslayers. 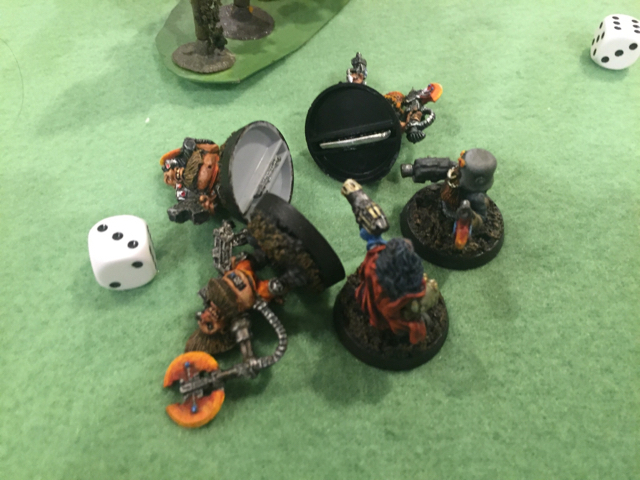 The ogryns plowed into a sacrificial warrior squad that had lost their plasma gunner and wiped them out. After the first turn for each side, the heavy weapons fire became largely insignificant. Subject to frenzy, the cyberslayers charged and surrounded Steefan Horking. That began a multi turn combat in which Horking methodically chewed through slayers. 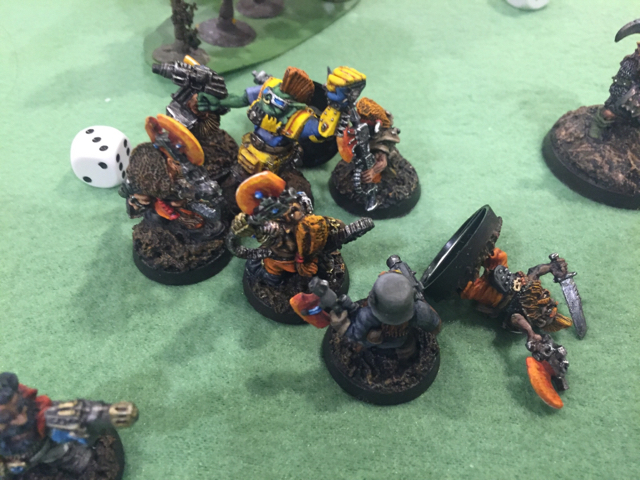 It only ended after the warlord joined the charge on the second turn of the melee. 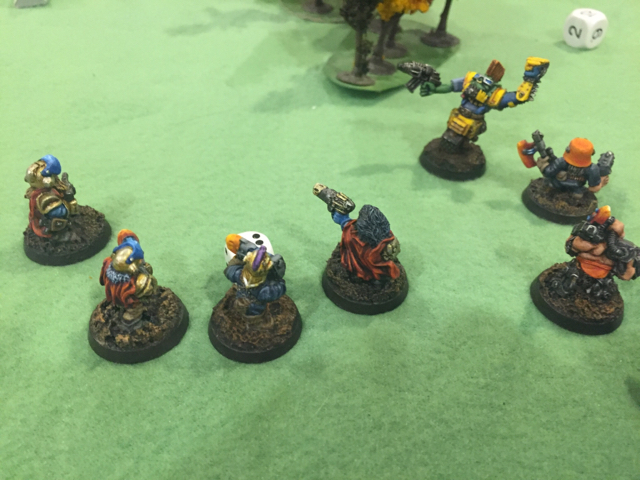 When the squat warlord finally brought Horking down, nine of the ten slayers had been crushed by his powerfist. 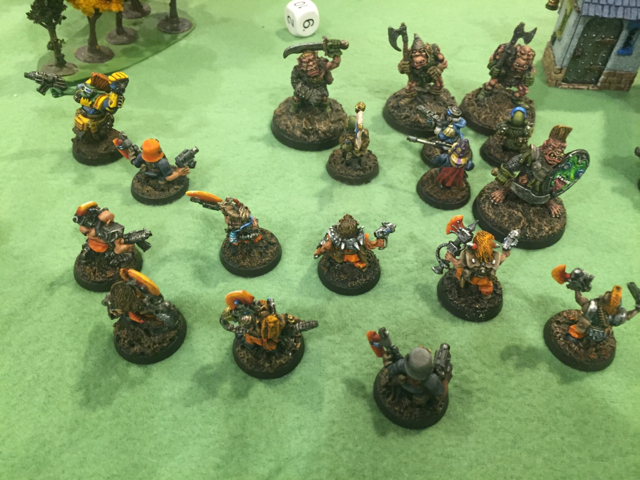 The ogryns charged the scouts. The scouts each won their first round of hand to hand combat, but each failed to wound. 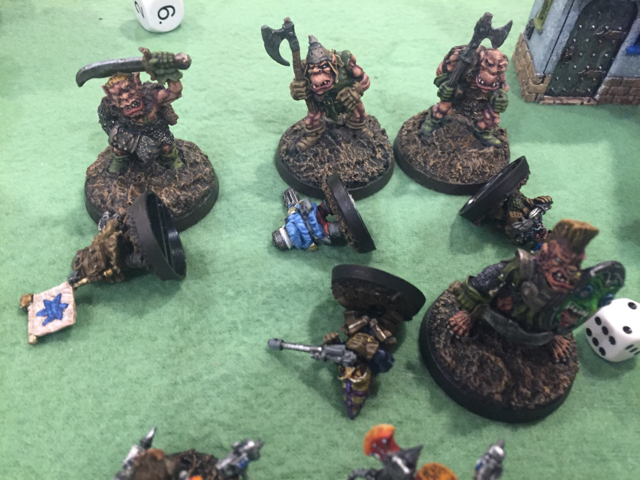 On the hand to hand combat in the subsequent squat turn, the ogryns smashed them. The game ended with the line infantry continuing to take shots at each other (but not doing all that much) and the warlord and hearthguard trying and failing to eliminate the last two ogryn. Here was the table at the end of the game. The squat plasma guns were terribly underwhelming in this game, suffering from multiple jams. Though the heavy plasma did its work in the first turn (trimming over 10% of the orks strength in point value in one shot), the terrible deviation two turns later was tough to take. The combat with the ork warboss and the cyberslayers/warlord was a reminder of how powerful characters are in hand to hand. Despite slayers being dedicated close combat troops, they did little to ding up the warboss and the warlords arrival was essential to ultimately winning the combat. The spiked arm is a great wargear card. The extra WS was of tremendous benefit in the combat. We continue to have loads of fun with second edition. i'm glad that second ed. orks can do alright. thanks for sharing, it looks like a fun afternoon. daddyorchips wrote: i'm glad that second ed. orks can do alright. thanks for sharing, it looks like a fun afternoon. Thanks, it was a great time, and has now given me a bunch of ideas for what to paint next. Awesome report man! Really diggin those Fantasy Orgyns. airbornegrove26 wrote: Awesome report man! Really diggin those Fantasy Orgyns.